Stumbled on this flowchart from Jenny Mueller-Alexander at Arizona State University Libraries about researching a single company or an industry. I like how the company process splits into private company and public company – which has a huge impact on the amount of information available. Remember that anything a company tells you is either to their benefit, either required my law (like disclosing financial statements when their equity is traded on public markets of capital like stock exchanges). The Canadian Marketing Association announced on their website that last summer, the International Journal of Mobile Marketing ran a special issue on mobile marketing in Canada (Summer2012, Vol. 7 Issue 1). Although you can purchase single articles from the publisher, this journal is available from the Library. This image is taken from the last printed version of CARD: Canadian Advertising Rates and Data. It presents the cost to advertise in various media outlets, this case is Maclean’s a popular news magazine mostly read in Ontario. Notice how you have various costs, from black & white, 1 color and 4 colors. Also, some other options such as free standing inserts (FSI) and classified ads. 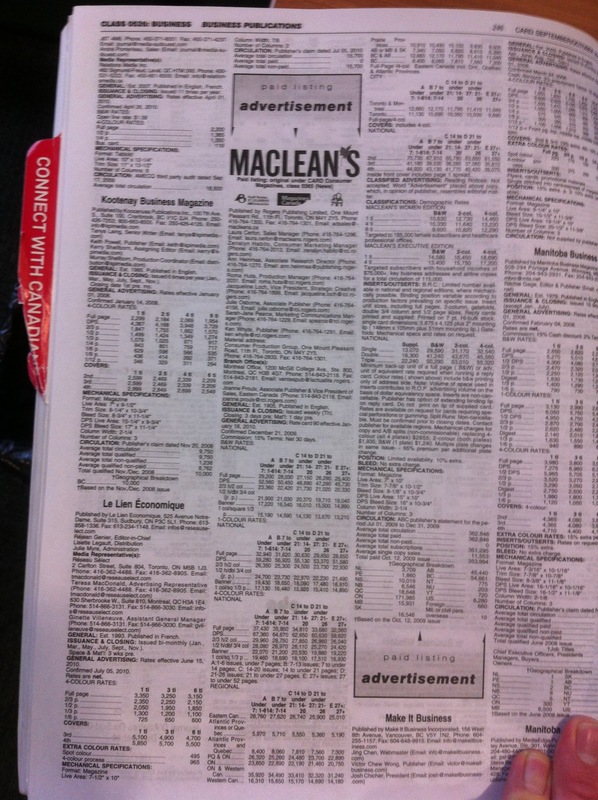 The readership of Maclean’s is the last thing showed, including total paid, complimentary and newsstand. Also a good strategy is to look for free reports from national statistical agencies. Anything missing? Let me know in the comments! These are some interesting reports that cover the video games industry in Canada. In addition, you may want to search for articles that cover this topic. Observatoire de la Culture et des Communications (Institut de la statistique du Québec) has a few reports on “Multimedia” production, in particular: Production multimédia au Québec : portrait des établissements en 2007-2008 (Optique Culture, No 60, Juin 2010). City of Montreal Public Libraries receive a donation of 5000 video games on April 27th 2012 (press release in French). Sign on to Passport GMID and search (top right corner) for “video games canada” (provides industry reports, consumption statistics and company profiles). PMB Product Data provides results of a yearly survey of over 11000 Canadians’s consumption habit. Look under “Home Electronics > Video Game Systems” as well as “Computer, Phones & Internet > Cell Phones/Smartphones/PDA”. See also: OpenGameArt.org for open licensing digital assets.